I’ve been to so many beautiful places across the globe. In fact, I can’t think of a single place that isn’t beautiful in its own right. There are times when selective vision helps to block out human intervention on the landscape and imagination helps to fill in the voids left behind, but, on the whole, the entire world is just plain beautiful. That said, it’s ironic that what I enjoy most about travel is not the intrinsic beauty of a place. No, it’s the people, those very same people who altered the landscape that I sometimes do my best to avoid seeing. People. What I love most about traveling are the people I encounter…their habits and customs, their beliefs and attitudes, even their appearance. It’s the people who fill me with wonder and awe. Spaniards are a lovely people. They are open and accepting. They love to talk, sometimes all of them at once, about issues that inspire them to boisterous agreement or disagreement, but in the end, they accept and move on. Spaniards are hospitable and kind. I’ve met many people who are eager to know about my life in another part of the world. Many on The Camino offered a glass of wine, a cookie, or…ahem…a cigarette. I can’t abide the smell of cigarettes, but I can admit that there is something languid and leisurely about sitting back in one’s chair, tilting one’s head back, and slowly releasing a narrow plume of smoke that drifts upward and away. The image is one of pure relaxation. 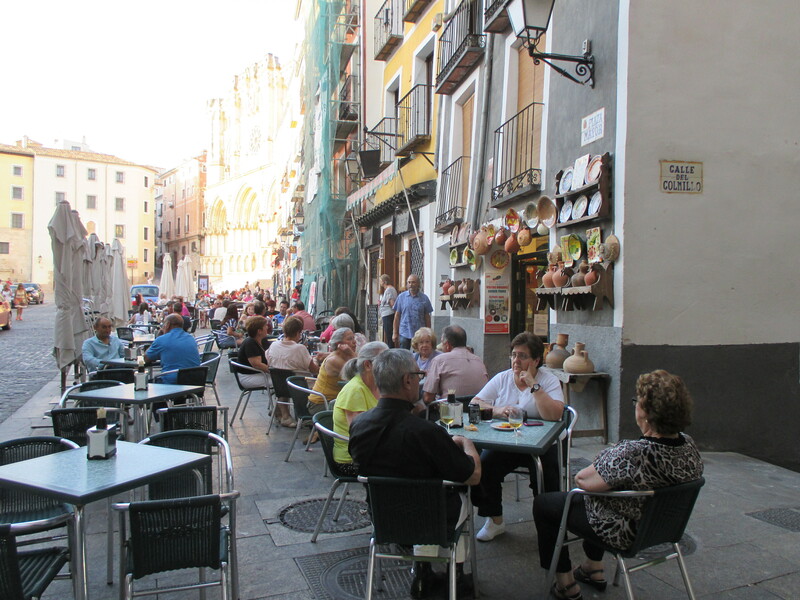 In the evenings Spaniards go en masse to the streets where they stroll, eat, drink, and enjoy life with leisure. Spaniards, on the whole, are laid back people. Sometimes, in my rental car, while waiting at a crosswalk, I use a stopwatch to see just exactly how long it can take someone to saunter across the street. I always take a book with me to the post office because it can take longer to buy a postage stamp than it takes for the letter to arrive once posted. (The postal system, Correos, inside Spain is very efficient.) 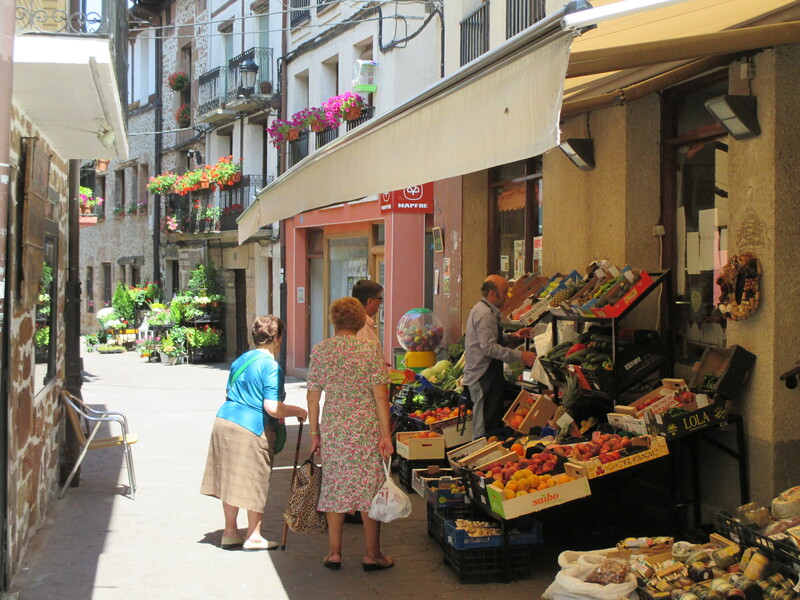 At the market, where you must wait your turn to be served by the shopkeeper who tends to only one customer at a time, Spaniards never buy just one thing. It’s a kilo of potatoes, half a kilo of carrots, half a kilo of red peppers, a head of lettuce, three cucumbers, a kilo of onions, half a watermelon, a kilo of peaches, a bunch of parsley, four lemons, a pomegranate, and two heads of garlic. Customers in Ezcaray await their turn for the shopkeeper’s attention. All in all, the pace of life in Spain is pretty slow. But put Spaniards on an airplane and an inexplicable transformation takes place. These amiable, easygoing people become darkly single-minded. Overhead lockers, for example, become prime parking space and Spaniards will run, jump, and force their way past other passengers to shove their bags into an empty spot that someone else is just about to occupy. One Spaniard, who “cut off” another passenger in a dangerous maneuver, then turned with a smile of relief, truly oblivious to the other passenger’s dilemma about where to stow a bag. I booked a two and a half hour flight on EasyJet, a no-frills airline, from Madrid to London. I didn’t want to risk being wedged between passengers so when I bought the ticket, I paid an additional twelve euros for a guaranteed seat assignment. When boarding time came, I occupied my aisle seat toward the front of the plane. Along came a Spanish couple and their sixteen or seventeen year old daughter. They entreated me to exchange my aisle seat at the front of the plane for a center seat at the back of the plane so that the three of them could sit together. I kindly declined the opportunity explaining I had paid for the seat I was occupying. There then followed a barrage of insults, in Spanish, complaining about how ill-mannered some foreigners are. I laughed and said, in perfect Spanish, that pretty soon we would be in Great Britain and then the shoe would be on the other foot. Well, anybody who’s ever tried to learn a foreign language knows full well that you can’t make a literal translation of an idiom. All three of them looked at my feet, back at my face, and then quietly sat down without further discussion. Not even the Germans bother to try to keep the Spaniards in check. (Remember, I’m talking about airline travel here.) Yesterday on my Lufthansa flight from Madrid to Frankfurt, there was general chaos as the recently landed plane approached the gate. Well before it had come “to a complete stop and the captain [had] turned off the fasten seatbelt sign,” Spaniards were up and moving. Two people raced up the aisle toward the front of the plane, colliding with another passenger who was charging down the aisle to reclaim the suitcase she had stowed in the overhead bin in the back of the plane. Once retrieved, she lofted it overhead and then pushed her way through other passengers who, despite the plane still moving, were crowding the aisle. Already overhead bins had flewn open and luggage was being yanked out with a sense of urgency. One bag coming down met with the head of one passenger attempting to stand up. Another passenger shouted several rows back to anyone who would listen, “Hand me the black bag with the pink tag.” She shouted several times before the bag was finally removed from the bin and shunted over the heads of passengers in the aisle until it reached its owner. And then we waited. It’s a simple fact of flying: only one person at a time can exit through the door at the front of the plane. I’ve long maintained that when a large plane arrives at an airport, the back of the plane arrives twenty minutes later than the front of the plane. All the rush in the back of the plane only serves to highlight the inevitable wait. This is one of my favorite Claudia Camina posts. I love the title, the photos, and the writing. Very entertaining, funny, and perceptive! I sure would love to be sitting at one of those sidewalk cafes right about now. Today’s high here in the VOTFUS will be 112! Thank you for your feedback. I struggled with this piece and I wasn’t very happy with it when I finally posted it. It’s nice to know that all the effort is having good results. Very funny. Your comments make me think of the way Spaniards (and perhaps Italians too) drive. They seem to believe that security distance between cars is ornamental, and therefore superfluous. So, if they see enough space between you and the car ahead, they stuff themselves in no matter what! But they are not being ugly, it’s just the way it’s done, I guess.